Chewy center; crispy, caramelized edges, not too fat, not too thin, the BEST Chocolate Chip Cookie! Add a little Christmas bling to this cookie and toss in some jewel toned, holiday colored M&M’s. I’ve spent years perfecting my chocolate chip cookie. Especially at altitude, it has to have just the right chewy to softness factor, loads of rich chocolate and sprinkled with a tiny hint of sea-salt. Adding some M&M’s just dresses it up and adds even more chocolate! 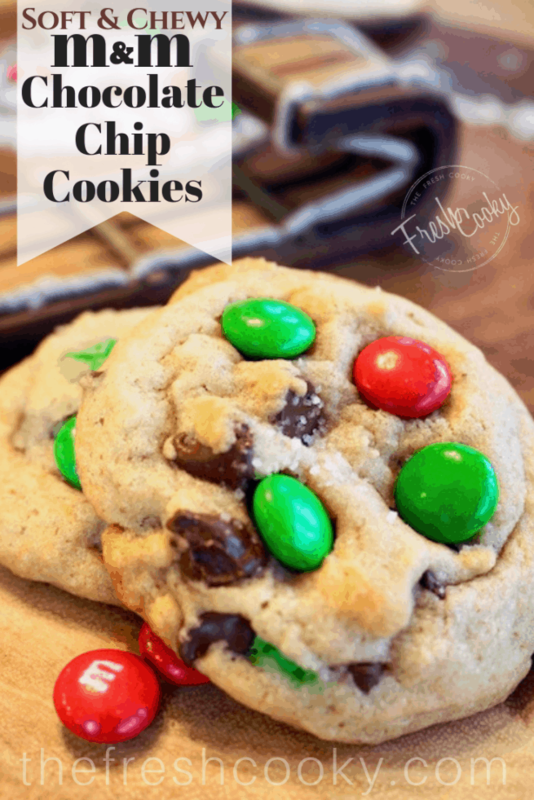 The recipe is so simple really, follow my Chewy Chocolate Chip Cookie recipe, omitting the 2/3 cup chocolate chunks and replacing them with 1 cup holiday M&M’s of your favorite color. You can swap out any holiday M&M’s! The handy printable recipe is below, but for step-by-step visuals, refer back to the Chewy Chocolate Chip Cookie recipe post. 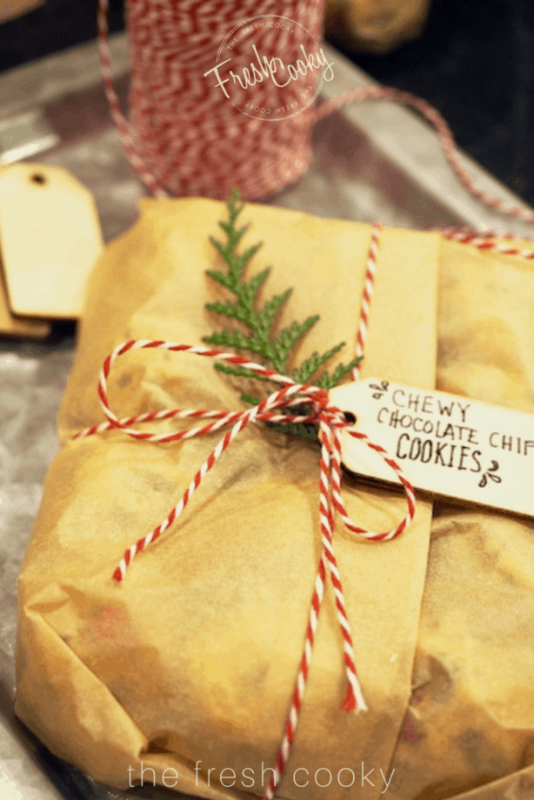 These cookies are FABULOUS packaged up in the dough ball form and given to family, friends, co-workers and neighbors as gifts over the holidays. They will THANK YOU, profusely! 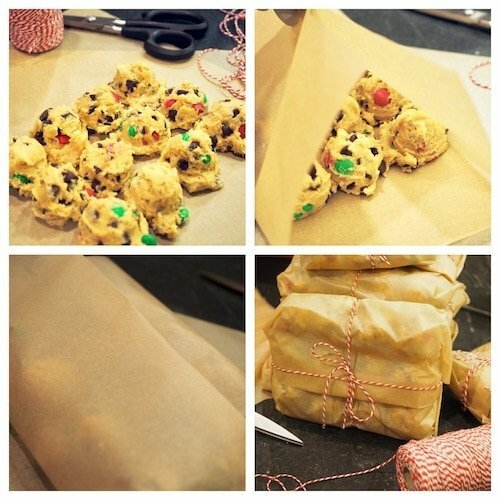 Check out my post on how to package cookie dough for gifting, fun, yummy, creative gifts!! An American Holiday tradition, the ultimate chewy chocolate chip chewy cookie, crisp on the edges, soft, and chewy centers with oodles of chocolate and seasonal M&M’s. Add eggs, one at a time, cream on medium-high 1 minute for each egg addition, scrape down sides in between. With mixer on low/stir, slowly pour in ½ cup of flour mixture at a time and gently mix, add water in between flour additions, don’t over mix. Once mixed well, scrape sides of bowl and pour in chocolate chips, minis and seasonal M&M’s, stir (with low on mixer or by hand) on low, until combined. Enjoy warm or room temp. If not enjoying all the cookies at once, freeze dough balls until firm, then place in freezer ziplock bag until ready to use. Once ready to bake, take out of freezer and place 2 inches apart on parchment lined baking sheet. Allow cookies to soften while the oven preheats to 375 degrees.. Bake as directed above. Always use real butter, not butter blends or substitutes. Always, always refrigerate your dough for at least 10 minutes prior to baking, up to 36 hours (covered); 2-3 months if frozen. Remove from oven when edges are golden and appear baked, but centers still appear slightly under-baked. Cool on pan 2-3 minutes before transferring to wire rack. SMALLER OR LARGER COOKIES | If smaller cookies desired, use a small cookie scoop and bake for 6-8 minutes. If larger cookies are desired, use a large cookie scoop and bake 10-12 minutes. © 2018 | This recipe for Holiday M&M Chocolate Chip Cookies was featured first on The Fresh Cooky.